Do you feel Murrieta needs more art, music, theater, dance, etc? 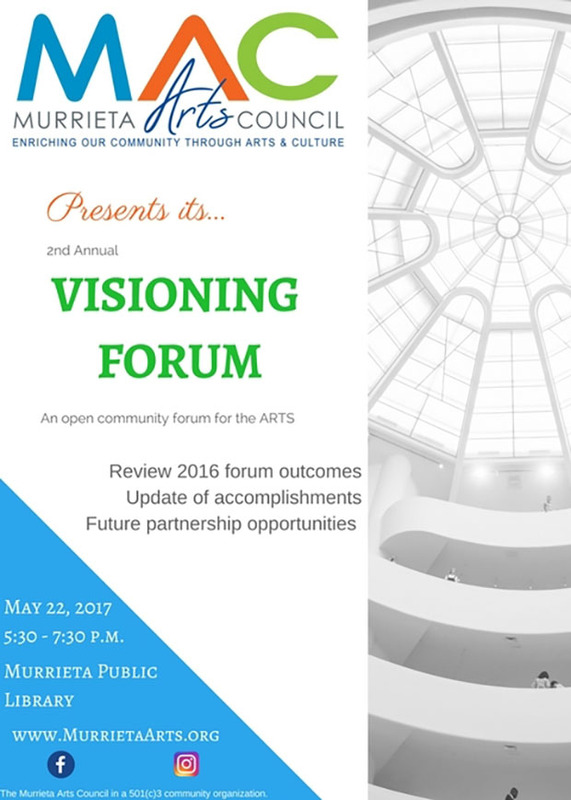 The Murrieta Arts Council agrees and invites you to share your ideas at its upcoming Visioning Forum for the Arts in Murrieta. This free forum will be Monday, May 22 from 5:30-7:30 p.m. at the Murrieta Library. Join in conversation with local people who produce, teach, enjoy or at least care about the arts. They will introduce and discuss their ideas about bringing more arts to the community. For example: Develop an Online Arts Calendar or an Online Gallery? What new venues can be created or developed for the performing arts in Murrieta? What events or funding sources can help with these efforts?